Zucchini pasta with lemon and spinach pesto. For topping I sprinkled with toasted almond meal, sesame seeds and fresh parsley. Serve it on it’s own or as an side dish. Use a julienne tool for cutting the zucchini into long thin strings. First toast the almond meal and sesame seeds in a big pan over medium heat until golden. Make sure you don’t burn the mix. Then pour it into your blender with the parsley and pulse for a few seconds and set aside. For the pesto toss all the ingredients in your processor and blend until you get an even paste. 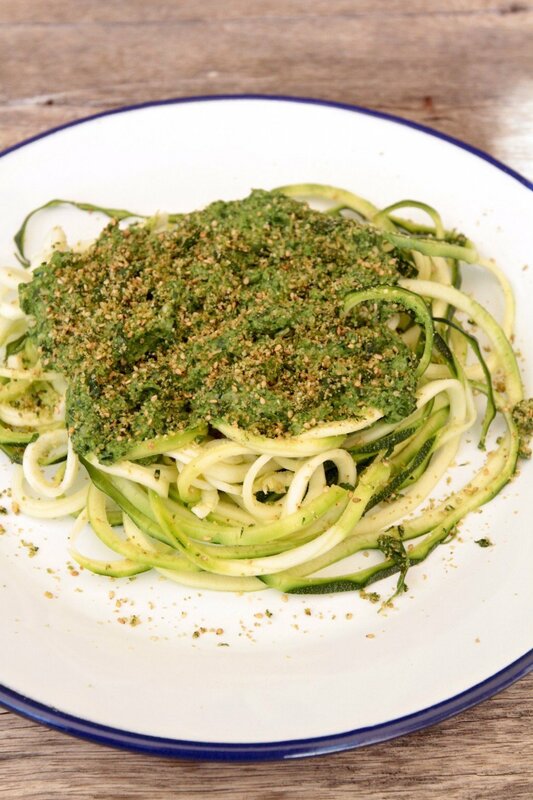 Pour the pesto over the zucchini pasta and sprinkle with the crumb mix.